Dramarama by E Lockhart Sarah hates her boring, razzle -dazzle (her words) free life in Brenton Ohio. The only time Sarah feels any excitement is at tap and jazz lessons at Miss Delilah's school of dance. With an older father and deaf mother, Sarah's home life is too quiet. At school she simply blends in. When Sarah meets Douglas (Demi) at an audition for a summer theater program she finds what she was looking for. Demi is new at Sarah's high school. Like Sarah, he keeps a low profile. Beaten up at his last school Demi has perfected his straight boy drag. When Sarah and Demi meet its an instant connection. Demi quickly renames Sarah, Sadye. Sadye is everything Sarah isn't, embracing her height and big nose. The two make it into the Wildewood summer program. Both are excited to be getting out of Brenton, believing this is their chance to shine. Wildewood is filled with many stars, including Demi. Each summer six shows are put on. Demi is cast in a lead roll. At Wildewood he is free to be himself and fall in love. Sadye experiences isn't as good. She is cast as a tree and a boy. The different levels of success and Demi's new boyfriend will test Sadye's and Demi's friendship. Going in I didn't expect Sadye not to be one of the talented ones. The name Sadye screams star not tree. That's one of the things I love about this novel. Sadye loves everything about theatre but sometimes we are not good at the things we love. Sadye must watch as all of her friends get cast as major parts. Sadye must come to terms with her roll at Wildewood. I loved Demi, Lockhart made me a quick believer in this Black gay teen. She had me at Topdog/Underdog that 's the play Demi uses for his audition. I believe Lockhart didn't try to over think Demi and in doing so created a wonderful character many refuse to acknowledge. Lockhart didn't make race a primary factor nor did she ignore it. For her part Sadye didn't want to talk about it, thinking it was the only thing that separated them. Demi doesn't like that Sadye won't to acknowledge that he is Black. The two times Sadye and Demi talk about race, Sadye quickly changed the topic. Lockhart gives us a glimpse of Demi's homelife. He is an only child with cold parents who he can't be himself with. When Sadye and Demi became inseparable at the audition, Sadye wasn't the only one who felt saved. Augusta Savage was one of the primary artist of the Harlem Renaissance. This is a picture book biography of Augusta's early years. The author quickly establishes young Augusta's love of clay, she creates clay animals in the backyard, even through her father disapproves. Augusta has the support of her mother and teachers. "From the time I can first recall the rain falling on the red clay in Florida. I wanted to make things. When my brothers and sisters were making mud pies, I would be making ducks and chickens with the mud." After reading that I thought, this is an artist I would like to get to know. I was hoping to read more of Augusta's words. Two things I look for in a biography quotes and dates. They keep a biography grounded in fact. When I read a picture book biography I expect authors to fill in gaps and try to keep young readers interest. As long as there are quotes and dates that can be verified I actually look forward this aspect of a children's picture book biography. There are no dates In Her Hands and the only quote is the one on the back. I know part of the problem is the author didn't have much information on Augusta Savage to work with but still I need something that says this is a biography about Augusta Savage and not a story. I didn't get that. I would still recommend In Her Hands. It will make young readers aware of Augusta Savage, a not so well known talented artist and the Harlem Renaissance. Its also a good introduction to the art of sculpting. I enjoyed the afterword. Its filled with the facts and dates I was looking for. Schroeder mentions some of Savage's well know busts, including ones of W.E.B Du Bois and Marcus Garvey. The one of Du Bois was featured in the Harlem branch of the New York Public Library for more than 35 yrs. In the 1930 she created a sculpure for the World's Fair in New York. The two page afterword with a photograph of Augusta Savage in her studio help make this book for me. Peter Earnest is former CIA and the founding executive director of the International Spy Museum, located in Washington D.C. This is a must read for any young reader who loves spy related things, be it novels, movies or kits. This book is for any young reader who has ever wonder what do spies do? or how do I become a spy? "A metal screw tumbled out of the microphone casing and onto my tuxedo shirt as I lay on my back securing the bug into a hidden compartment in the back of the antique wooden desk. I had excused myself from my host's small dinner party and secretly stolen into his office while supposedly on my way to the bathroom. Sweating profusely and aware that he was only a room away, I quickly finished and hurried back to the party. I wiped the perspiration off my face, and brushed the small pile of wood shavings that had fallen on my shirt into a little envelope and pocketed it. The bugging operation was done, but it was a close call! Gilda Joyce: The Dead Drop by Jennifer Allison - This is the final book in the Gilda Joyce series. Normally I would suggest starting with book one, however this book works well as a stand alone. Its also a perfect compliment to The Real Spy's Guide To Becoming A Spy. In the Dead Drop, Gilda Joyce lands an intern post at the International Spy Museum. I love this series. John Brown : His Fight for Freedom by John Hendrix - This is the story of John Brown, a White abolitionists who was so opposed to slavery he tried to start an uprising. Going into this book I knew nothing about John Brown. 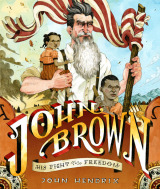 Hendrix has written a great introduction to John Brown for young readers and adults alike. One thing I appreciate and look for a children's biography, is how smoothly authors can supply definition into the text without breaking the rhythm. Hendrix does this skillfully throughout the novel beginning with the first page. Hendrix begins in 1840 when John Brown was living in the free state of Ohio. Hendrix tells of Brown's respect and friendships with his Black neighbors. The author quickly establishes the type of person Brown was. Brown gives his front pew to his Black neighbors. "He stood and offered the entire black section his front pew. He escorted them to the best seats in the house, as his family went to sit in their seats in the back pew, behind the wood stove! At the end of the service, the white church members were very angry and demanded that John and his family leave the church immediately"
That passage tells me alot about Brown. Many Whites in Hudson were against slavery but didn't believe in equal rights. Brown offering up his pew shows that he wasn't the average White abolitionist. "Upon reading these words, John felt a tremendous force growing inside his chest. He would never forget the day he discovered these words; it was then he mad an oath to fight slavery until its very roots were destroyed. So John began to formulate a plan of grand liberation. This plan would not free one man at a time it would free thousands"
After that declaration biography picks up a bit. In 1847 Brown meets with Fredrick Douglass to explain his plan to end slavery forever. In 1854 pro slavery and abolitionist were fighting for control over Kansas and Nebraska. The abolitionist were not prepared for armed slave owners. Brown fought hard in Kansas. Another thing I look for and appreciate in children's biography is how much truth will the author give without sugar. Again, Hendrix succeeds. He doesn't gloss over or ignore Brown storming the house of pro slavery settlers with his sons and killing them at a creek. Brown plan to end slavery begin with raiding Harpers Ferry, Virginia. It was the home of large federal armory and a symbol of Southern power. John Brown raided Harpers Ferry on October 17, 1859 with 21 men. Brown's attempt was unsuccessful. Hendrix tells the reader of the events of that day and how Brown's heart may have lead to his failure. John Brown is captured, and once again Hendrix keeps it sugar free, showing Brown's sentence of death by hanging. Hendrix illustrations make Brown larger than life and I think its very fitting. He give us the many faces of John Brown; compassion, determination, anger and worry. This is a wonderful biography. It was a pleasure not to read more of the same. Hendrix has made John Brown a controversial figure in history accessible to young readers. Due check out the review over at Seven Impossible Things Before Breakfast , where they break down the illustrations of children's books like nobody's business. They share some of the books interior which is a must see. I just had the pleasure of being interviewed by author Justine Larbalestier about girls and sports books. Check it out People may be coming over from Larbalestier's blog, so I figured now was a good time to do Girls Got Game III, to round up my reading kick of girls playing sports. I promise there will not be a Girls Got Game IV, I won't do like the SAW movie series. Where it all began Girls Got Game, I link to old sports reviews prekick and list a few to be reviewed. It continues with Girls Got Game II again I read and reviewed all the books mentioned here. There obliviously should have been another post because I never did a round up. So here it is now. Tackling Dad by Elizabeth Levy, my review I enjoyed this one a lot. This was a fun middle grade book about a girl who joins the football time. I loved that all her friends played sports and one girl even joins the team with her. The Necessary Hunger by Nina Revoyr, my review I loved this one, do check out the google preview. Twenty Miles by Cera Hedley, my review I really enjoyed this one, do check out the google preview. Soccer Chick Rules by Dawn FitzGerald, my review This book was so much fun to read in a Meg Cabot sort of way, which to me is a very good thing. I Wanna Be Your Shoebox by Christina Garcia, my review. I loved this book, the MC was many things including a surfer. Rogelia's House of Magic by Jamie Martinez Wood 15 yr old Marina and Fern have been best friends since second grade. Marina's mom has taught her daughter to only cherish her Spainish roots and dismiss her Mexican Heritage. Marina's is embrassed she can't speak spanish. Fern's loves nature and is involved in a cause to preserve the land . Fern love the barrio she live in, the same one Marina's mom looks down upon. While picking up an astrological chart for her mom, Marina and Fern also get a spell book for teens. After, casting a spell, Fern has the ability to see peoples aura's and Marina can hear voices. Best Friends Marina and Fern, make quickly make room for Xochitl (So-chee), who has just moved from Mexico to California. Xochitl is trying to cope with the recent death of her twin sister, Graciela. Xochitl's grandmother Rogelia respects and pratices magic that is influenced by the old ways and incorporates nature. In Mexico, Xochitl was her grandmother's student. She has the ability to make herself invisible. In California Rogelia is the new maid in Marina's house. When Marina and Fern find out Rogelia is a curandera (a folk healer) they want her to mentor them in magic. Rogelia agrees, if Xochitl agrees to return to her studies. She does and the magic lessons begin. I really enjoyed Rogelia's House of Magic. Wood's has created three very different and believable characters in Marina, Fern and Xochitl. I enjoyed their friendship. I do think Marina and Fern accepted Xochitl a little too easily. Though sometimes people just click. The chapters alternate beween the friends smoothly, with the author avoiding unnecessary information. I loved that Wood's doesn't favor one friend over the other. They get equal time are their stories to unfold. The three friends learn how to trust, each other, themselves and the magic. The characters in Rogelia's House of Magic are 15 but like many of Meg Cabot's young adult novels its perfect for reader's 11up. Check out the book trailer. I think the song is a perfect fit. Yankee Girl by Mary Ann Rodman It's 1964, Alice's father is an FBI agent. He has been reassigned to protect the rights of Black people who are registering to vote. The Moxley's will be moving from Chicago to Mississippi. I loved this book. Alice is doing her best to figure out Mississippi. Since her father is an FBI agent she is used to making friends quickly. Not this time though, everyone calls her Yankee girl. Alice's new school Parnell will have Black students for the first time. One of those students, Valerie will be in Alice's sixth grade class. On a daily basis Valerie is tormented by her classmates. Alice doesn't take part or speak up she just wants to fit in. I love that Alice and Valerie didn't become instant friends. At home Alice is always worried about her father's safety and the Klan. Yankee Girl isn't simply about integration or Alice trying to fit. Its also an excellent reflection on race relations of the south at that times. Yankee Girl was published in 2004, it came to my attention this year, after reading Mary Ann Rodman's interview for the Amy Bowllan's Writers Against Racism (W.A.R) series over at School Library Journal. Here is part of Rodman's answer to the first question. DESCRIBE THE IMPACT THAT RACISM HAD ON YOU AS A YOUNG PERSON. In August 1964, when I was ten, my family moved from Chicago to Jackson, Mississippi. My father was an FBI agent who was involved in the case of the three missing civil rights workers (aka: The "Mississippi Burning" Case). Until then, I had never had any significant contact with another race. Now I was suddenly thrust into a tumultuous world that was divided by race and class. Crossing racial lines was not just a radical social act; it could prove to be fatal. A thousand times a day, my fifth grade peers reminded me that African-Americans (they used the "n" word) were childish, dumb, not as "good" as white people, and a host of other condescending (at best) or insulting (at worst) characterizations. 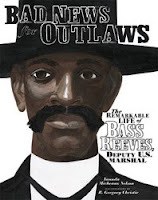 Bad News for Out Laws is the remarkable story of Bass Reeves, Deputy U.S. Marshal. Reeves was born into slavey in 1838. In 1860's he escaped to Indian Territory, living there until 1874. I love that this book talks about the relationship between Native Americans and African Americans during slavery times. In 1875 Reeves is hired as U.S. Marshall to work the Indian territory which was over run with out laws. Reeves was a quick shot familiar with the area, and the perfect man for the job. Usually I start with the text but since this is a graphic novel, I will change it up a bit, and begin with artwork. The first time we see Deputy Reeves, he' s chasing an outlaw on horseback. Desperate to escape the outlaw jumps into a store window. Christie's artwork is alive on the page. Its the small details I noticed and loved. Reeves bracing down on his horse getting ready to make the capture. The outlaw covering his face from flying glass and wood panel. Steeped in earth tones, the reader easily gets the feel of the old West. In the podcast interview Christie said he only had one photo of Bass Reeves to work with. That must have been one great photograph. Anyone of Christie's art panels I could see hanging in a museum. I started with the illus. but in no way is the text lacking. Nelson does a wonderful job of detailing Bass Reeves life. Nelson places Reeves life into three key periods. Slave Days, Freedom and Family (life on the Indian territory) and Deputy U.S. Marshall . I love the tone and feel of the words. I am always amazed by how much information authors can fit into a children's biography without cramming the pages too tight. Nelson does exactly that, and she is not dependent on the afterword to fill in gaps. The afterword simply gives the reader more. Vaunda Micheaux Nelson and R. Gregory Christie have created a wonderful biography on Bass Reeves. A great edition to any library. CORA Diversity Roll Call is being hosted by Susan @ Color Online this week. Its all about short stories. "Give us a list of your favorite short story titles. Do a profile of a short story author. What were your favorite short story reads this year?" I've read two short story collection this year which I loved. No Such Thing as the Real World by Six best selling authors - When I reviewed the book I highlighted two of the stories. Beth Kephart's "The Longest Distance" which is so amazing and still my favorite . Also Chris Lynch which reminded me of Zusak's "I Am The Messenger" if you've read that novel you know its a high compliment. I debated over whether or not I should highlight Jacqueline Woodson's "The Company" and K.L Going's "Survival" because both authors sucked me right in. Woodson's "The Company" Is about a Black gay male dancer in New York. The character and story Woodson's created are fully drawn and beautiful. I loved it. Going's "Survival" is the story of two sisters, Rachael and Sarah. This story is so well put together, its short story clinic good. Some how the author establishes the dynamic of the sister's relationship from when they were seven, fits in the high school years and Rachael's graduation day all without missing a beat. I loved it and was truly invested in Rachael. Tales of Outer Suburbia by Shaun Tan - This is one of the best books I've read all year. It's beyond beautiful. Up All Night by six best selling authors - This is a wonderful collection of stories. David Levithan's The Vulnerable Hours and Patricia McCormick's Orange Alert could be used in a short story clinic right along with Going's Survival. Voices in First Person edited by Lori Marie Carlson - A collection of 21 stories by Latino authors. Like poetry one of the great things about short stories the reader is allowed to choose. That's what I did with this wonderful collection. Sept 15 is the beginning of Hispanic Heritage Month. Over at authorslatino if you celebrate by reading or promoting a book by a Latino author you can win a book. There are some great prize books available so do check it out. Now I will take the oppurtunity to talk about three new novels by Latina authors. One if a mystery a read earlier this year. Two are new fiction releases I am looking forward to reading. "From the verdant hills of Rio de Janeiro to Evita Perón’s glittering Buenos Aires, from the haven of a corner butcher shop to the halls of the United States Embassy in Montevideo, this gripping novel—at once expansive and lush with detail—examines the intertwined fates of a continent and a family in upheaval. The Invisible Mountain is a deeply intimate exploration of the search for love and authenticity in the lives of three women, and a penetrating portrait of the small, tenacious nation of Uruguay, shaken by the gales of the twentieth century." A wonderful interview with the author at Voces, and do read the excerpt provided at the bottom. Its what made me want to read the book. Only read a few sentences before I decided I want more. "You know this story, Jeremie? How if a person dies, and their body is stolen by a zombie master, the zombie master will make the body rise and work all day and all night as a slave. The zombie understands only his suffering. He has no power to break away. He can only work and work. But there is one little trick that can save the zombie. Do you remember what it is, Jeremie? Did your mama tell you this? If the zombie can get a taste of salt, he will understand. He will open his true eyes and see that he has been made a zombie. And he will turn against his master. He will obey him no longer. He will make himself free. I am not so quick, Jeremie. Among us boys. I use these books and think nothing about the title. Then one day I see what being able to read and write is like. You understand things you didn't before." I really enjoyed listening to Djo story unfold. The more time Djo and Jeremie spend together the greater their connection. Jeremie has a story one of her own. Taste of Salt was such an easy book to fall into, I highly recommend it. Would be a great selection for a boy/girl book club. 11 yr old Chela Gonzalez is excited about starting sixth grade. "Apa told me to imagine that sixth grade was like standing at the top of the tallest building downtown. It was like being up there in that tall building and looking down. The people on the street looked just like ants. To sixth graders, third graders, all the way down to pre-kindergarteners. Each grade was farther away than the next, smaller than the last. The best thing was those ants looked up to sixth graders. Knowing this made me all the more nervous and exicted about starting sixth grade." Chela father is always wakes up Chela and her 3 siblings for school. When Chela and sister Silvia oversleep ,they know something is wrong. Chela's father has suffered a stroke. Chela's begins school a few weeks late. Chela returns to school an outcast. Her best friend has left her behind for the popular girls. At school Chela is friendless. Though all her classmates are Mexican she is teased about her accent. "In my fifth grade bilingual class everyone spoke funny like me. But kids who'd been in the A classes sine kindergarten were different. They spoke mostly English at home and sounded a lot like the people on television. I'd never read out loud in front on kids like that. I was nervous, so I sped up and stumbled over myself. In that instant Camila's group went from pretending I didn't exist to snickering behind my back." I really liked this novel. The author doesn't do anything fancy, she simply tells a story very well. Its easy to see how important Chela's father is to the family. In Chela, Martinez has created a character many readers will want to get to know. Olu's Dream by Shane W. Evans Evan's has illustrated over twenty-five children's books. Though, Olu's Dream is the first time Evan's has done both the text and illustrations, my expectations were high. I was not disappointed, I loved Olu's Dream. Catwalk: Strike a Pose by Deborah Gregory This is the second book in Gregory's Catwalk series. This continues where the first one left off. Pashmina Purrstein is a junior at Fashion International high school in NYC. She is also a future model and entrepreneur. Each year the school holds a Catwalk competition. Five houses will compete and the winning team will get money to start their own label, an overseas trip and other prizes. In book one Pashmina gets enough votes and the House of Pashmina is born. In this book every house must submit a line for the design challenge. The winning team gets $300 bonus towards the catwalk competition. The challenge "take things everyday in your environment and turn it into fashion." Pashmina has problems with her computer. Later it's revealed someone in the Pashmina's house has given her computer a virus. Pashmina suspects two of her best friends. Its obvious who the guilty party is. The question the reader should be asking themselves is "when will the quitly party be caught?" not who. The author makes the reader feel the doubt creeping into Pashmina about who she can trust. Being leader is a lot of pressure now Pashmina must worry about someone trying to sabotage her efforts. I loved the Catwalk competition blog. Contestants are free to express themselves. Since the book focus is on Pashmina's house its one of the few times the reader can learn about other houses/leaders. One of the house leaders Moet Major is a replacement. The first ever and no one takes her seriously. In her blog entry she shares a little presidential knowledge, beginning with Nixon first bid in 1960. "Another historical point I can relate to after Nixon resigned as president, Vice President Gerald R. Ford succeeded him. Now just because G. wasn't nominated in the first place doesn't mean he wasn't legit enough to be head of state. Which brings me to a present situation that will soon be recognized as official fashion history I may have become the house leader by default - a first in the catwalk competition's 35 year history but I' m an authentic leader, nonetheless"
The other entries are just as good. Someone questions where have all the Black designers and models gone. Giving a little fashion history mentioning designers Jon Haggins, Scott Barrie and Stephen Burrows. Gregory's found a very smart way to slip in a little knowledge and make it work (as Tim Gunn would say) without it coming across as forced. These are student's of fashion so it makes sense that they would know and love talking about its history. Nathaniel Fludd, Beastologist by R.L. La Fevers Before I talk about how much fun this book is, I'll begin with the cover. I love it and it fits the novel perfectly. The cover's creator is Kelly Murphy she's also responsible for the wonderful illustrations. Flight of the Phoenix is book one in a new series starring 10 yr old Nathainel (Nate) Fludd. He hasn't seen his parents in two years. Their airship recently crashed in the North Pole. The book opens with Nathaniel having been tricked by his caretaker Miss Lumpton. "It was one of the most important moments in Nathaniel Fludd's young life, and he was stuck sitting in the corner. Miss Lumpton had promised him an overnight trip to the city to visit the zoo. Instead he found himself in a stuffy office with their suitcases at his feet and his sketchbook in his lap. He'd been given clear instructions not to listen in on Miss Lumpton's conversation with the lawyer. The problem was the they sat only three feet away and the lawyer spoke rather loudly"
After hearing she's been left a small sum by Nate's parents, Miss Lumpton says a quick goodbye. Nate's is rushed to catch a train to live with an aunt he's never meet. Nate comes from a long line of beastologist. The Fludd's study mythical beasts like dodos and griffin's. Most begin their travels and studies by the age of eight. Nate will be going on his first expedition with his aunt Phil. The two will be flying in a small plane to Arabia. "Well, Arabia is in the Near East. We'll fly across the channel to France, then down across Europe to Turkey. We'll clip the Mediterranean Sea, than land in Arabia. We'll stop for a short rest and refueling in Budapest." The book is filled with some great black and white illustrations. One of my favorite is Nate on the wing of the plane. Something is wrong propeller, and Nate's aunt wants him to fix it. "Gripping the side of the plane for dear life, he shuffled his feet along the wing, inching closer to the propeller. The plane bucked and dipped, adjusting to his shifting weight. Even with the slower speed, the wind screamed past him, tugging at his shirt, his helmet, his body, trying to dislodge him from his wobbly perch. His heart hammering in his chest, Nate kept his eyes glued to the nose of the plane and tried not to think about how far down the ground was"
Toni, told me this wonderful tribute to author E. Lynn Harris. When asked if I was going to put it on my blog, I said no. I try to only post about fiction books that crossover to teen readers. When I saw tribute I quickly changed my mind. 1, its too beautiful and to share and 2, it fits in perfectly. Amy Bowllan is running a must read series over at her School Library Journal Blog Writers Against Racism (W.A.R) Everyday I look forward to reading the next entry. Only three questions. All the answers are very telling, and honest. The final W.A.R. question, In what ways combat the effects of racism and promote tolerance? Harris introduced many readers to their first contemporary Black gay characters. With each new book Harris gave a voice to characters that were ignored. He made it okay for people to start talking about homosexuality. That is what W.A.R. is all about. In April of this year two 11 year old boys in different states committed suicide. One Black, one Hispanic because of homophobic bullying in school. Read the NYT's article Both stories are sad and senseless. As far as children's books go, these boys do not exist. They are a myth to be ignored. If only that weren't so. If only there were books out that could be discussed openly in the classroom or maybe even read in private, giving a voice to this very real population. Dr. Zetta Elliott, is the author of the bestselling middle grade novel Bird. She wrote a wonderful piece about why the inclusion more stories in children's literature is important and necessary. Its a must read. Posted today on a holiday weekend mind you, and already has 18 comments. So do check it out. Luv YA Bunches: Book One by Lauren Myracle I love this cover. Two unrequested MG arcs that showcase diversity on the inside and outside were dropped off at the bookstore from Amulet books. This and Michael Buckley's newly released Nerds. Both bestselling authors prove its not hard to incorporate a little diversity in books with several main characters. Katie-Rose, Camilla, Yasaman and Violet all have flower names. This name connection doesn't come into play until later in the book. In the beginning the girls are getting ready to start the fifth grade. The chapters alternate between the girls starting with Katie Rose. With each chapter the personalities of each girl takes shape. I must admit I found Katie Rose a little annoying at first (not too much) but she did grow on me. Camilla is in with the It girls, Modessa and Quin but they mistreat her alot. Yasaman, simply wants to make friends this year and is a computer wiz. Violet is the new girl at school. Katie Rose and Yasaman are the first to become friends. They begin chatting on a myspace type site created by Yasaman. One of the things I loved about this book, the friendship of the four girls didn't just happen, it took time. Their road to friendship started on the first day, when Camilla lost her lucky bobble head turtle. Modessa frames Katie Rose. There were a few misunderstanding and hurt feelings but the girls work it out. Myracle does a wonderful job of developing each character. My favorite is Yasaman and Violet's story will touch many. Girls will easily be able to find themselves in one or all the characters. Fans of Myracle's birthday series beginning with Eleven will love Luv Ya Bunches. Sylvie and the Songman by Tim Binding This was beautiful and sometimes creepy, I loved it. 12 yr old Sylvie lives with her dad and their dog, Mr. Jackson. Sylvie's dad is a musician, who invents strange musical instruments. He wants to discover the notes between the notes. Sylvie's dad isn't the only one who believes in the power of an animals song. All the animals in the zoo except the lion have lost their voice and Mr. Jackson has lost his bark. Sylvie's dad is kidnapped. Sylvie must find her dad and figure out a way to give the animals back their songs. The only person she can trust is her friend George. He is the only non musically inclined person in the story. Though he is an artist when it comes to kites. George spends the night after the kidnapping. The two search the house for clues. The magic and music make this a beautiful read. Sylvie's dad instruments caused an explosion, proving how wonderful and important music is. Sylvie is claimed by a fox. The fox gently bites her, giving the power to hear animals. The two are forever connected. Now to the creepy. I believe a characters creepiness factor is raised by its name. Binding created one that gave me serious chills. The Woodpecker Man. That is such a great name. Even without Angela Barrett's perfect fitting illustrations, a reader can easily visualize the Woodpecker Man.